Finally, a card game that Breaks All the Rules! This popular European game has been re-designed for North American game players. In this unique game, you get to play cards out of turn! You can do whatever it takes to accumulate points; take extra turns, steal opponentsâ€™ cards, and even disguise cards as your own. The â€œBig Fat Zeroâ€� card allows you to cancel out your opponentsâ€™ points. You are on the edge of your seat until the last card is played. Includes 88 cards and instructions. 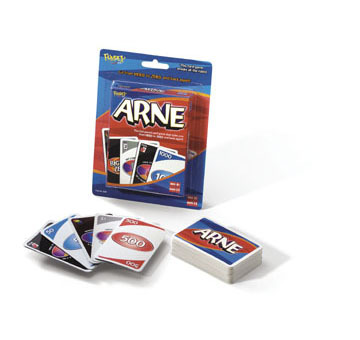 Other products in the "Arne" series.